Check out more on our Yelp and Facebook pages! Providence Community Acupuncture is a most welcome, affordable oasis of relaxation amidst the chaos. I feel better as soon as I walk in most times and always feel good walking out. the acupuncturists are friendly, knowledgeable, intuitive and gentle. I also really enjoy the community atmosphere where everyone in the room is quiet and relaxed. It has helped with pain, muscle tension and anxiety. all you have to do is breathe. – Jean D.
This place is life-changing. I cannot recommend it enough. Relaxing does not even begin to describe the peace and contentment of visiting PCA. Treat yourself to an appointment during a busy work week. The staff is supremely friendly, helpful and knowledgeable. They greet you by name, and are always aware of your treatment and what you’re working on. 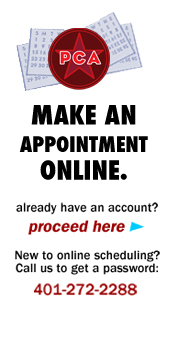 It’s also very easy to make/change an appointment. The online system is very convenient whether you’re booking in advance or day of. And, you simply cannot beat the price structure. I joined POCA last year. It was absolutely worth the benefits! Check them out in their super new amazing location!!! -Sarah E.
Most awesome place. You can relax with the pins as long as you need. Other people are in the room and it is quiet. Sliding scale is very reasonable and the staff is excellent. They put the pins in the same places other acupuncturists did. -Greg B. Turned to PCA about a month ago in an effort to resolve some lingering pain and stress-related symptoms. I booked 10 visits over three weeks. The fee scale made the course of treatment affordable, and the physical outcome was beyond appreciated! -Tracie J. This place goes beyond acupuncture. It tries (and succeeds) at creating a non-judgmental, welcoming environment that is socio and environmentally conscious. The acupuncturists get straight to the point and didn’t put me through long uncomfortable lectures of what I haven’t tried and why. After a brief history of my conditions, we came up with a treatment plan that I could work with. There was no pushing for many different supplements or lectures on grand lifestyle changes. I found the recliners to be amazingly comfortable and the gentle white noise or soft gong music in the background is a very nice touch. -Raquel O.